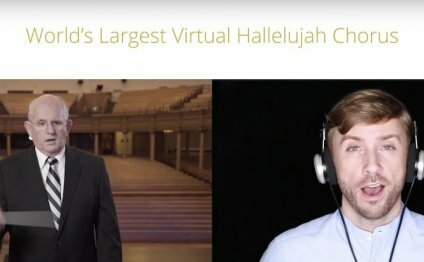 The Mormon Tabernacle Choir is extending an open invitation to people around the world to sing and perform with them virtually this Easter. Singers, choirs and fans all over the world can upload a recording of themselves singing one of four parts (soprano, alto, tenor or bass) of the well-known “Hallelujah” chorus from George Frideric Handel’s “Messiah.” The best performances and choral voices will be featured in a “virtual choir” performance with the Mormon Tabernacle Choir and Orchestra at Temple Square. Entries will be accepted through Tuesday, March 1, and the final virtual choir performance video will be released on Sunday, March 13. Musicians and YouTube stars Peter Hollens and Tiffany Alvord are encouraging their fans to upload their own recordings. Peter and Evynne Hollens are providing the vocals for the sing-along videos. On March 4, 2016, the choir and orchestra will release a new recording of Handel’s “Messiah” in two versions: the complete oratorio and a 60-minute highlights version. They will stream “Messiah” live on Good Friday, March 25, at 7:30 p.m. MDT from a performance in the Salt Lake Tabernacle. Visit for details.